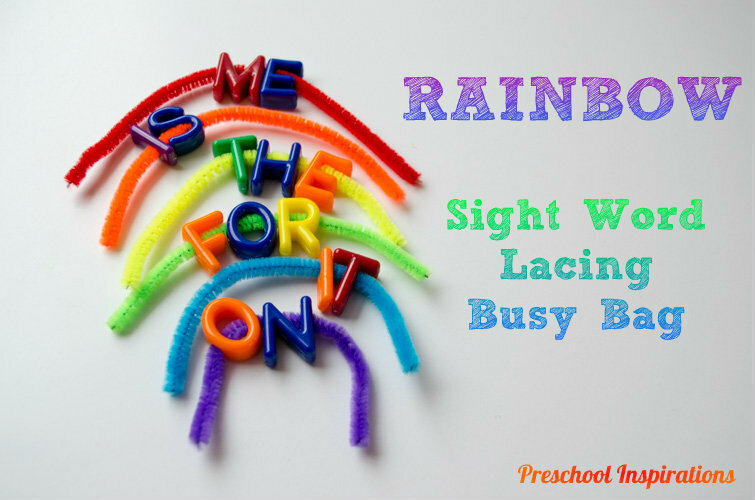 I came up with this rainbow sight word lacing busy bag for my kindergarten-aged daughter, who I am homeschooling. Some of my Pre-K kiddos are ready for this as well. This post contains affiliate links for products we absolutely love and use on a regular basis. This activity is super easy to prep. 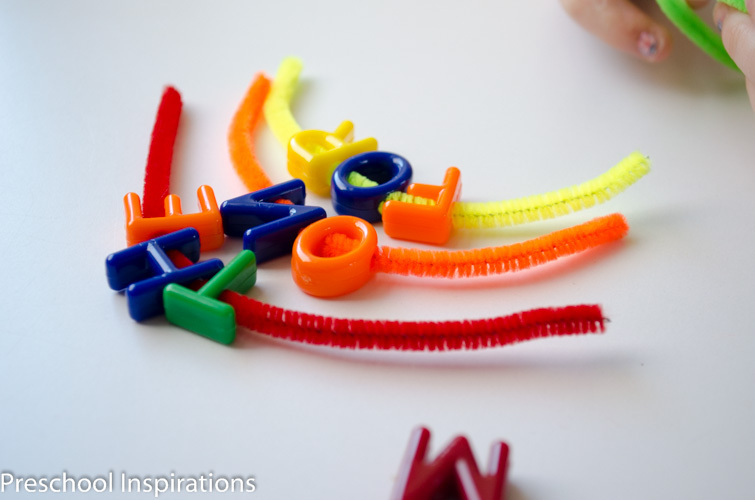 You’ll just need three items: Big Letter Beads , chenille stems/pipe cleaners, and my free printable sight word cards. I set the activity up by choosing the sight word cards we are working on and setting out the corresponding letters for her to choose from. The sight word cards have the words written in upper case and lower case. Since upper case letter beads are much easier to find at a store, I put the words in that form so the child could match the letters. Then the lower case word is printed underneath since that is the goal eventually. Sugar and Spice just looks at the words on the sight word cards and gets right to work. She just happens to be a mirror writer, which means that she often writes right to left and reverses her letters quite a bit. I do not stress over this because she is left-handed, which is where mirror writing is most frequently seen. This sight word activity has really helped her with this though. We look at the letters and compare to see if any are reversed or if she put them on right to left instead of left to right. It seems that holding the actual letter bead and feeling the shape of the letter is giving her some extra sensorial input. If you are looking for an easy and fun sight word activity, I highly recommend this because it is so inviting and hands-on. 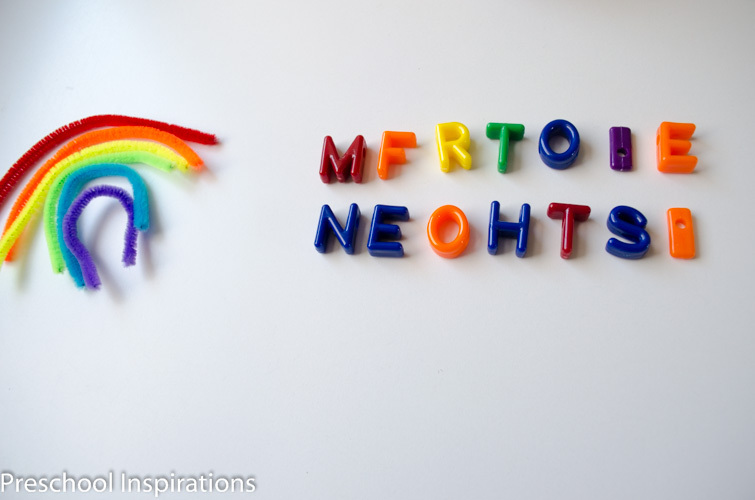 I guess it is hard to go wrong with sight words and rainbows! If you are looking for more rainbow fun, don’t stop now! 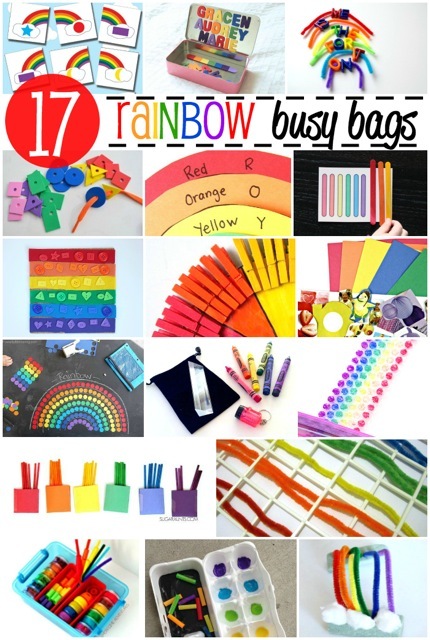 Here are some more incredible rainbow activities to do with little ones from some of my blogging friends! 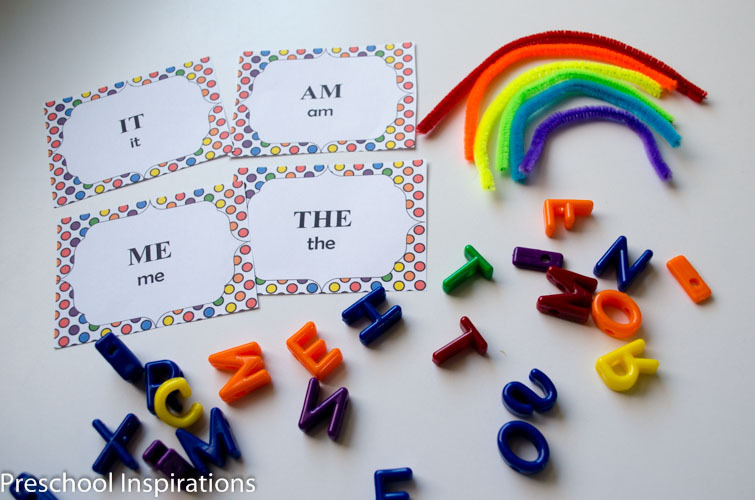 Magnetic Rainbow Name Box // Mama. Papa. Bubba. I love this hands-on sight word and fine motor practice in one!! Sharing.